GREEN BEANS (Maxibel French Fillet): very slender green bean with firm texture and good taste. See Week 8 for usage and storage information. YELLOW BEANS (Rocdor): long, slender, yellow bean; meaty, firm texture and no watery taste. See Week 8 for usage and storage information. CABBAGE: You will receive Gonzales (a sweetly spicy green mini cabbage with 4-6-inch heads) or Red Express (solid, round, 2-4 lb. red heads). Cabbage is considered a beneficial digestive aid and intestinal cleanser. It has a good amount of calcium, potassium, magnesium, and Vitamins A & C.
CUCUMBERS: You will receive either Olympian (considered a slicing cucumber with dark green, straight 8-9 in. fruit; crisp with fresh flavor) and/or Little Leaf (considered a pickling cucumber with blocky, medium-length, distinctively bright emerald green fruits, which are good for fresh eating and pickling) and/or Sultan (small delicate cucumbers with thin skin, a seedless interior, and gourmet flavor). See Week 7 for usage and storage information. Chives—mild, onion-flavored herb with long, slender, hollow leaves; can be added to potato salad, baked potatoes, soups, salads, omelets, dips and spreads, pastas and sauces. You can also chop fresh chives and freeze them with water in ice cube trays to use later when needed. Lemon Balm– these fragrant lemon-minty leaves make a delicate herbal tea, served hot or cold; good addition to lettuce or fruit salads and ice cream; nicely paired with grilled fish or lamb and tossed with steamed vegetables; also aids in depression, tension, or nausea. Sage–an herb from an evergreen shrub in the mint family with long, narrow, grayish-green leaves; a musky aroma and a warm and spicy taste; used in making sausages, stews, breads, and teas; enhances meats, vegetables, salads, pickles, and cheese. Spearmint– leaves are bright green with mild flavor and fragrance; used in both sweet and savory dishes and in alcoholic drinks, such as Mint Juleps or Mojitoes; good as a hot or iced tea. See other “Mint” recipes in “A to Z” cookbook. KALE: You will receive Curly Kale (well-ruffled, curly green leaves on green stems; this variety makes a good, roasted “kale chip”). See Week 1 newsletter for usage and storage information. Cooking Tip: Slit from top to bottom and wash thoroughly with root facing up to remove all of the dirt trapped between the leaf layers. See Week 8 for usage and storage information. SUMMER ONIONS: larger bulb than green onion with edible green stem attached. See Week 5 for usage and storage information. NEW POTATOES (Red Norland): smooth, red skin and white flesh; great baked, boiled, or roasted. How to use: New potatoes are just young potatoes that haven’t had time to convert their sugar fully into starch and often have a crisp, waxy texture and thin, underdeveloped wispy skins, so are good boiled or pan-roasted, but particularly suited for potato salad, since they hold their shape well after being cut and cooked. How to store: Refrigerate new potatoes if not used within 2-3 days, but use up sometime during the 1st or 2nd week of receiving them. These potatoes have not been cured, so will not last as long as “cured” potatoes, which should not be refrigerated, since low temperatures convert the starch to sugars and may turn dark when cooked. SUMMER SQUASH/ZUCCHINI: You will receive some variety of Yellow or Green Zucchini (gourmet golden or green zucchini with uniform, cylindrical fruits) or Yellow Crookneck (long, curved neck with a sometimes bumpy, yellow skin; buttery flavor and firm texture). *Keep in mind “zucchini” and “summer squash” are basically interchangeable in recipes. See Week 5 for usage and storage information. SWISS CHARD: close relative of garden beets; very small, multi-colored, large veined, semi-crinkly, dark green leaves. See Week 3 newsletter for usage and storage information. TOMATOES (Sun Gold Cherry): The first tomatoes of the season are finally here! You may fill one pint of this exceptionally sweet, bright tangerine-orange cherry tomato; less acidic than the red cherry tomato, so slightly less bland in flavor; popular as a garnish, in salads, or as a cooked side dish that can be sautéed with herbs. 1. DILL WEED FLOWERS available: For those of you interested in making pickles, we have dill weed flowers available at the farm and at market. Just let us know, if you need some. See pickle recipe in recipe section of newsletter. 2. KID FARM HIKES: We had a great response to our June monthly farm hike! Our next one happens to be this week on Friday, July 26, at 2 PM. We’ll use all our senses as we take an approx. 30 minute hike with CSA member, Sheila Schueller, and explore the farm’s fields, wetlands, and forest. Sheila teaches ecology and field biology classes at Eastern Michigan University and the University of Michigan. Meet at the Distribution Shed at 2 pm. No RSVP necessary, but if you email that you plan to attend, then we know to wait for you. 3. U-PICK AVAILABLE: Please call ahead if you plan to pick on other days besides Farm Distribution Days (Wed. and Fri.), so we can make sure someone is around to help you. U-pick Flowers: Some of the flowers are ready in the u-pick flower garden. You may pick 1 bouquet of up to 10 stems per household for “free”. This means that if you are splitting a share, each household can pick a bouquet. If you are able to help us out with our seed costs, we would like to encourage anyone to donate $1 or more when possible. Extra bouquets will cost $4. You may want to bring a vase or a jar to keep your flowers fresher on the ride home! We do have many quart-size yogurt containers for flower pickers to use as temporary vases. U-pick Beans: Green and Yellow available for $0.50/lb. 4. “LULU” COOKING CLASS ON July 31 still has 3 spaces left! We will be helping prepare a delicious 4-course meal with help from our guest chefs and fellow CSA members, Eric Lundy and Laenne Thompson. Their start up restaurant is called “LuLu” (which still has yet to find the perfect physical location! ), which sources local ingredients and adds a dash of global flavor to deliver deliciousness to your mouth\There will be a $10 fee for materials and handouts for each class. Please register by contacting us soon with your NAME, PHONE NUMBER, and E-MAIL ADDRESS in the body of the email. 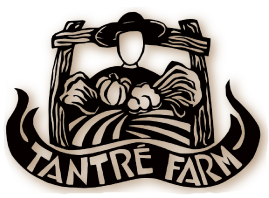 We have filled up spaces quickly, so let us know soon if you’re interested in joining us for this special meal together at Tantre Farm. More details about the meal will be coming. 5. WEEDING VOLUNTEERS STILL NEEDED: If you are interested–even if it’s just for 10 or 15 minutes before you pick up your box at the farm, come join us. Please contact us any day of the week or evenings until dark. Thanks for volunteering! 6. VACATIONS or OUT OF TOWN: Please remember to contact us at least by Sunday to make changes in pick up days or locations. Pluck the stems off the tomatoes and rinse them. Add them to a heavy saucepan with a tight-fitting lid with half the shallots, 1/4 tsp. salt, and 1 cup water. Cook over medium-high heat. Soon you’ll hear the tomatoes popping. Take a peek after a few minutes to make sure there’s sufficient moisture in the pan–you don’t want the tomatoes to scorch. If the skins are slow to pop, add a few tablespoons water. Once they release their juices, lower the heat and cook, covered for 25 minutes. Run the tomatoes through a food mill. You’ll have about 1 cup. Chill well, then taste for salt. Just before serving, combine the remaining shallots in a bowl with the vinegar, chile (if using), oil, avocado, and herbs. Season with a pinch or two of salt and some pepper. Serves 3 as an appetizer. Wash cucumbers and pack in canning jars. Boil mixture of water, vinegar, salt, and sugar. Pack jars with one head of dill and garlic (by choice) and then cucumbers. Put another dill head and clove of garlic on top with a pinch of alum. When boiling mixture, start water for hot water bath. Once vinegar mixture is boiling, pour into jars, leaving 1/2 from top, seal and place in water bath. Once hot water bath begins boiling (high), boil jarred pickles for 2 min.. Turn off and leave for another 2 minutes. Take jars out and let seal. Preheat oven to 400 degrees. First, make pastry. Sift flour and salt into medium bowl. Cut in butter until mixture resembles fine breadcrumbs. Add enough water to make a soft dough. Roll out to line a 7-inch quiche dish. Bake unfilled for 15 minutes. For filling: beat margarine, honey, and cream cheese together in a bowl until soft and creamy. Beat in eggs and fold in lemon balm. Reduce oven temperature to 350 degrees. Pour filling into baked pastry shell. Bake for 45 minutes or until filling is golden and set, but not cracked. Serve with whipped cream, or cover chilled cake with a thin layer of sour cream. Makes 6 servings. STEAMED KOHLRABI WITH LEMON BUTTER (Farm-Fresh Recipes by Janet Majure) Serves 4. Trim kohlrabi, but do not peel. Steam over simmering water, covered, for about 40 minutes or until tender. Cool slightly, then peel and chop. In saucepan, melt butter over medium heat; stir in lemon juice, garlic, and parsley. Cook 2 minutes. Add kohlrabi and lemon balm; toss to coat. Season with salt and pepper.